Universal Edition, 1963. Cloth. Very Good. Folio - 13'' X 10.5''. 173 pp. Full Score, Folio, Red Cloth. ''A Kekszakallu Herceg Vara'' in bright gilt on spine. Markings in red and blue pencil by a professional conductor. Oper in einem Akt von Bela Balazs. Deutsche Ubertragung von Wilhelm Ziegler (Revision 1963 von Fussl/Wagner), English version by Christopher Hassall. Universal Edition Nr. 7028. Antokoletz 110. Sz. 48. 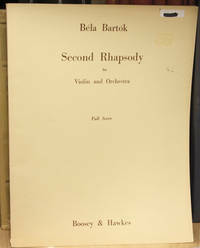 Composed in 1911, dedicated to Marta Bartok. First performed on May 24, 1918 in Budapest, Egisto Tango conductor, Loga Haselbeck as Judith, Oszkar Kaiman as Bluebeard.